Type: Nickel-Metal Hydride. Voltage: 2.4 V each. Capacity: 600 mAh. Length: 75.1 mm. Width: 18.1 mm. Thickness: 6.3 mm. Price: £7.99. Postage and packing included. Construction: Battery pack containing a pair of prismatic cells, twin flex and two pin plug. 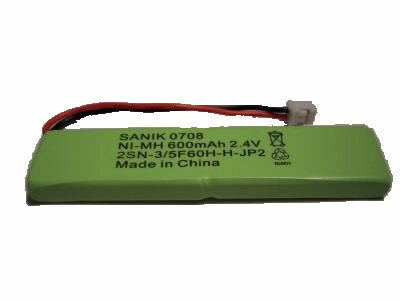 This CP74 NiMH battery fits many Cordless Dect telephones, in particular the iDect X3 and iDect X3i. These batteries are rated at 600 mAh for long talk time and long standby time. This CP74 consists of two rectangular NiMH cells with flex and connector and fits, amongst others, iDect X3, iDect X3i Cordless Dect Phones.